Global View of Waste Management by Antonis Mavropoulos: Smart waste management: Power to the people! Smart waste management: Power to the people! This post is the second one which is dedicated to address the issue of waste management in global cities and megacities. In the previous one (see waste management in global cities ) I concluded that we need to apply Complexity Theory techniques in order to manage waste management systems in global cities. In this one, I am going to give some practical views on how to do it. 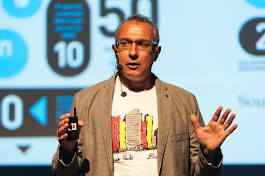 In a recent lecture I delivered in Brasilia, Brazil, during the XII Conferência das Cidades, at November 29 of 2011, I was presenting different possibilities to utilize modern technologies for a better urban waste management. The lecture was really successful and after the conference I received several invitations to deliver it in different audiences. I closed my lecture saying that “after all, if the combined use of social media, internet, SMSs and mobile phones delivered the collapse of Mubarak and other non-democratic regimes during the Arab spring, I am sure we can use the same tools for a radical improvement of waste management in our cities”. And this is exactly my point regarding complexity management in global cities and megacities. Few months ago, I was reading an excellent article in Scientific American, with the title “the Social Nexus”, written by Carlo Ratti and Antony Townsend. In this article I discovered several smart applications that are already applied in different parts of the world and their purpose is to improve, monitor and control the urban environment. Then I visited the web-site Trash Track. In this web-site I discovered some impressive visualizations of an experiment that was done just to demonstrate that for waste management there is a huge potential available if we use the modern technologies and the interconnected citizens in an appropriate way. Please visit the web-site and you will be impressed as I was, I am sure about it. And allow me to congratulate proffesor Rati and his team from the Senseable City Lab for this excellent initiative which opens new horizons for waste management. So, as you can imagine, this is more or less my main idea: to manage the complexity of waste management systems in global cities and megacities with the power of the already interconnected people. Or in another phrasing, to replace the traditional top-down approaches to planning and infrastructure delivery with a bottom-up approach that is based on crowd-sourcing. In urban areas, where a lot of people are using mobile phones, laptops and tablets, where smart phones do release new unimagined possibilities of interaction and rapid information, we can use them in order to have substantial improvements in waste management! But even where smart phones are limited and simple mobile phones are available, the power of SMS is enough to deliver crowd – based monitoring and improvements of waste management. Especially to the areas of street cleaning, collection, recycling and waste prevention, there can be radical improvements with limited cost! And this is exactly what we need during this period of global financial instability! The power of massive social collaboration is something that can be proven more powerful than any advanced technologies for collection and treatment of waste - and still it is ignored. We must start thinking in a different way and we have to do it now! There are just two pre-conditions for that. B. To inspire them in order to have a continuous feedback from them, to make them real human sensors of the problems in waste management, to create the right atmosphere and motivate people in order to increase social participation and interest for waste management. After all, the only way to use the potential of new technologies is to provide a meaningful and interactive citizenship. But this is supposed to be the core purpose of any urban governance, right? Let’s try to think that way. I am sure we have a lot to learn and much more to deliver. And I am sure that managing complexity with a network of thousands human sensors will be much more effective than ignoring it, as we usually do today. The problem is not with waste but with climate!